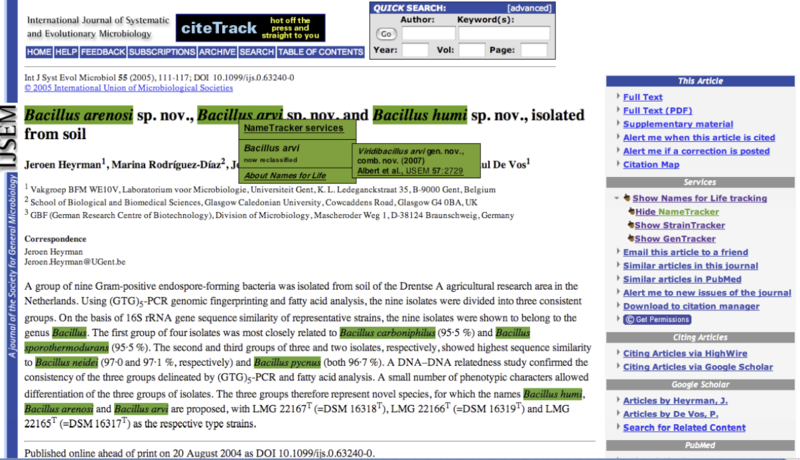 An example of forward linking of back content and dynamic linking to notify readers of name changes that affect back content. George Garrity will be presenting poster 142 (“NamesforLife Semantic Resolution Services for the Life Sciences”, Abstract Book, page 136) at the Tuesday evening poster session (5:00pm-8:00pm) in Salon ABCD. While you are here, please also visit poster 141 (“Further Refinement and Deployment of the SOSCC Algorithm as a Web Service for Automated Classification and Identification of Bacteria and Archaea”, Abstract Book, page 135) during the Monday evening poster session (5:00pm-8:00pm), also in Salon ABCD. Within the Genomes-to-Life Roadmap, the DOE states that a significant barrier to effective communication in the life sciences is a lack of standardized semantics that accurately describe data objects and persistently express knowledge change over time. As research methods and biological concepts evolve, certainty about correct interpretation of prior data and published results decreases because both become overloaded with synonymous and polysemous terms. Ambiguity in rapidly evolving terminology is a common and chronic problem in science and technology. NamesforLife (N4L) is a novel technology designed to solve this problem. [permalink] Posted February 10, 2008.